Elizabeth Ride has sent the following brief extract from BAAG report KWIZ#77 15.12.44. Mak Ho Yin has kindly attempted to translate the Chinese characters shown on this 1947 image of the factory. He admits, as the photo is blurred he can only actually half-read, half guess what is written. 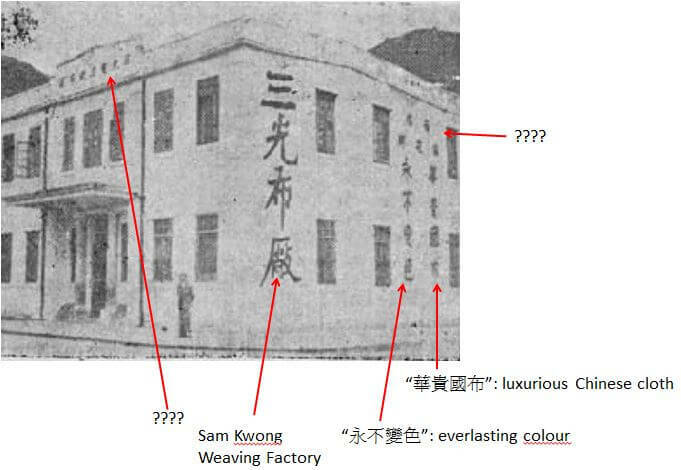 The Hong Kong Memory Project – Sam Kwong Weaving Factory – Hong Kong Memory (HKM) is a multi-media web site that gives free and open access to digitized materials on Hong Kong’s history, culture and heritage. The materials include text documents, photographs, posters, sound recordings, motion pictures and videos.